Pink Dress 8 in. x 10 in. Oil On Panel - BID ON OR BUY THIS PAINTING. 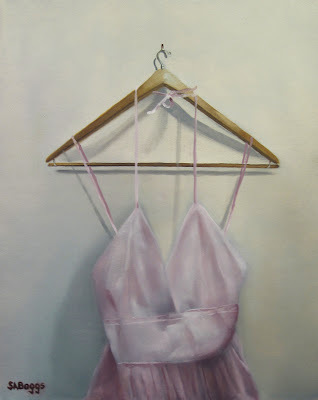 The subject is a pink dress on a wooden hanger. I had thought about doing this painting for several months and finally got the opportunity. The dress belongs to my daughter, and since she wasn't home I 'borrowed' it from her closet. This is a real contrast from the work boot painting that I did a couple of days ago and looking at the finished painting makes me feel happy and a little nostalgic at the same time, not sure why though. I also thought that the composition and colors were interesting, there are triangle shapes in the painting everywhere. I hope that you enjoy it.